In my beer-obsessed world, it’s become the go-to pairing for pretty much everything. Beer and ramen? Delicious. Beer and BBQ or German? Amazing. Beer and cheese? Obviously. Beer and pie? Actually, yes. So, why not beer and chocolate? And why not beer in chocolate? 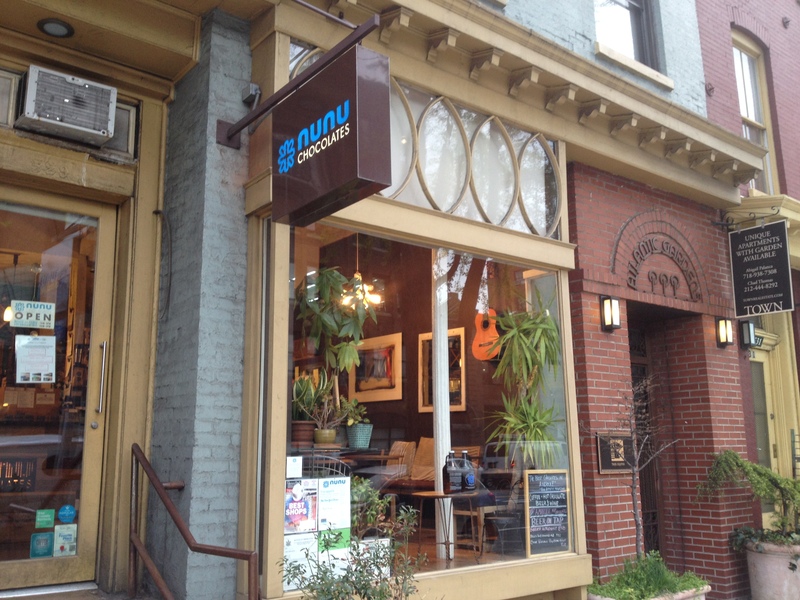 Nunu Chocolates, located on Atlantic Avenue steps from the Barclay’s Center, makes all their delicious chocolates in-store using cocao beans from a sustainable, family run farm in eastern Colombia. 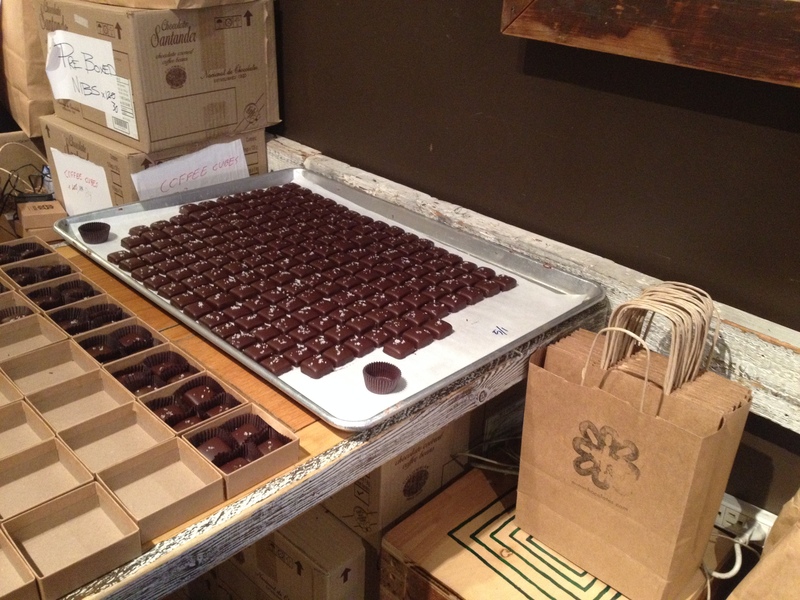 Their chocolate boxes make great gifts, and a delicious snack. A small seating area lets you enjoy the treats while watching them made in the open kitchen. They offer wine, coffee, and thankfully, beer. There are three rotating taps and thirty bottles/cans. On my visit, Barrier Antagonist ESB, Bell’s Two Hearted Ale, and Bear Republic Big Bear Black Stout were on tap, along with bottled selections such as Maine Beer Co King Titus and (yes, you’re reading this correctly) Hair of the Dog Adam. I find that most beer pairs well with chocolate. Stouts and porters complement chocolate with their own cocoa and coffee flavors. Sour beers offer a nice, refreshing contrast. The citrus in an IPA complements chocolates flavored with orange or lemon. But really, beer is great, and chocolate is great. Any combination works. Their handmade ganaches, truffles and caramels come in delicious flavors like Earl Grey, Double Dark, Raspberry, Prosecco, Peanut Caramel Crush, and Cashew Caramel. And if you can’t visit the store, you can shop/ship online. But if you’re drinking some beer with your chocolate, the chocolate might as well have beer in it too! 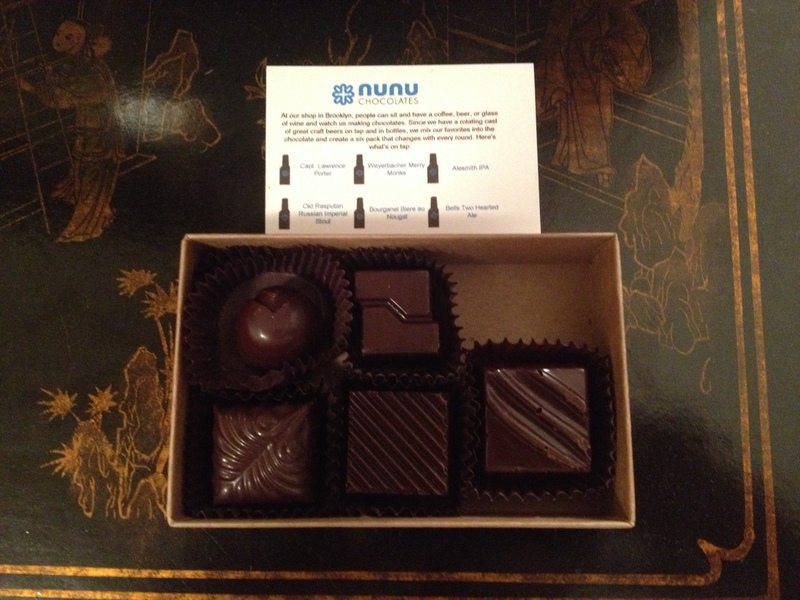 Nunu sells a six-pack ‘beer box’, six pieces of chocolate each made with a different beer (this also rotates). Mine featured Captain Lawrence Porter, Weyerbacher Merry Monks, Alesmith IPA, Old Rasputin Russian Imperial Stout, Bourganel Biere au Nougat, and Bells Two Hearted Ale. 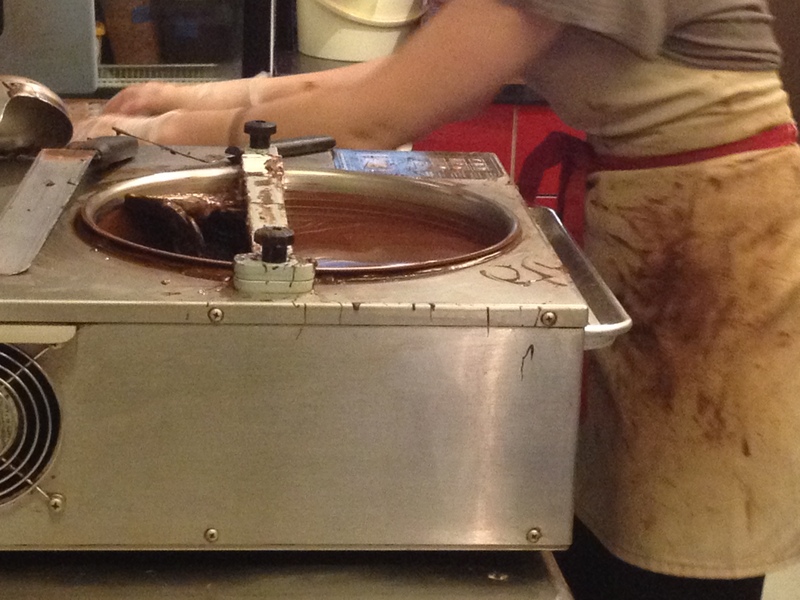 In some, you’ll find the chocolate brings out new flavors of the beer. Sometimes the beer will bring out something new in the chocolate. And others featured entirely new flavors born by the combination. May 8, 2014 in Bars, News, Restaurants.